Payments as low as $70/mo. 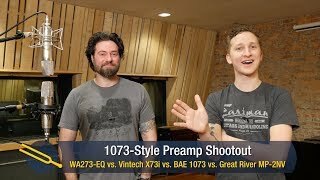 In this BLIND 1073-style preamp shooutout video, we put the Warm Audio WA273-EQ, the Vintech X73i, the BAE 1073, and the Great River MP-2NV up against each other on acoustic guitar & male vocals. Can you tell which is which? FOR THE RESULTS AND A COPY OF THE HIGH RES AUDIO FILES:(without YouTube compression), give us a call at (919) 682-5552 or email us at proaudio(at)soundpure.com. Warm Audio's goal is to put high-end gear in the hands of the world’s greatest artists, talent deserves to be properly expressed. Many great musicians are never heard in the right light due to budget restrictions, Warm Audio hopes to change this by bringing fully professional designs to all studios at affordable prices. Don't let our price tags fool you, all of our products have completely discrete signal paths and feature custom USA made CineMag transformers that are found in only the best designs in pro audio. I am asked often how Warm Audio is able to produce such high quality gear at affordable prices, many assume corners must be cut somewhere. My answer to this question continues to be "NO". Warm Audio stays true to original discrete schematics and does this without cheapening components such as our continued use of world class Reichenbach/CineMag transformers.